SkillsUSA today revealed 20 young competitors who will represent the United States at WorldSkills, the largest international showcase of the skilled trades. "They come from all corners of the country, they compete for different reasons, but they are all focused on one goal: standing atop the WorldSkills podium, a gold medal hanging around their neck, and honoring the American flag as 'The Star-Spangled Banner' fills the conference center loudspeakers," said SkillsUSA's executive director, Tim Lawrence. "From mechanical engineering to hairdressing to aircraft maintenance, we've watched these competitors gain expertise and create purpose behind their passions. We're thrilled the WorldSkills USA team will get the chance to represent their country while excelling at a skill they love." 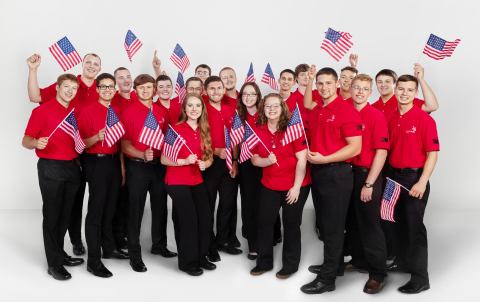 3M (News - Alert) will serve as the lead sponsor of the 2019 WorldSkills USA team. "3M and WorldSkills USA share a commitment to addressing the shortage of qualified skilled workers across many industries," said Mojdeh Poul, executive vice president, 3M Safety and Graphics Business Group. "As a global science-based company, we recognize that science, technology, engineering and math (STEM) skills are the foundation for many trades. This sponsorship is about inspiring the next generation of skilled workers and supporting their efforts in Kazan." Other proud team sponsors include Ferguson and Lowe's. Auto Body Repair: David "D.J." ors, 19, Lunenburg, Mass. Baking: Daylan Torres, 20, North Dartmouth, Mass. CNC Turning: Derbe Stroup, 18, Kunkletown, Pa.
"This WorldSkills USA team is the largest we have ever fielded, and I have extreme confidence that their experience, training and dedication will result in them bringing home multiple medals on behalf of the United States," Lawrence said. "We also encourage everyone to follow this amazing team on their road to Kazan @WorldSkillsUSA on Facebook (News - Alert), Twitter and Instagram, and interact with them using the hashtags #WorldSkillsUSA and #RoadtoKazan." SkillsUSA works year-round to instill positive attitudes, build self-esteem and empower over 340,000 students nationwide to excel in the career path of their choice. The organization has 600-plus national partners and is integral to the training in more than 18,000 classrooms. SkillsUSA inspires students to follow their passion in skills that are valuable to them and our country. Years of hard work supported by SkillsUSA has led these 20 competitors to the experience of a lifetime: the WorldSkills 2019 competition. 3M applies science in collaborative ways to improve lives daily. With $32 billion in sales, 3M's 91,000 employees connect with customers all around the world. Learn more about 3M's creative solutions to the world's problems at www.3M.com or on Twitter (News - Alert) @3M or @3MNews.